Note: this post was composed in December 2010, a full four-and-a-half years after my dinner at elBulli. Somehow I never got around to writing about this evening, but it definitely deserves its own post...even though the dinner pre-dates me setting up the blog. 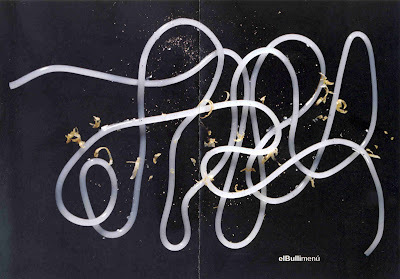 elBulli certainly needs no introduction. Back in 2005 when I came up with the idea of going there, it was the single hardest table to book, and I conservatively estimated that the 9,000 covers they do each year means the chance of getting a seat was about 0.2%. Things have surely gotten worse since then. In the fall of 2005 I had asked my concierge service to get me a table. I didn't have high hopes of actually getting a table, never mind getting one on my birthday. In order to maximize my chances, I asked for a table of 6 instead of 8 as I originally wanted, given that the restaurant only seats 50. I was therefore elated when I received confirmation in December 2005, notifying me that I would be spending my birthday at elBulli the following year. After a day visiting two three-star restaurants, we're lunching at Akelaŕe today. The restaurant sits on a hill just outside San Sebastián west of Monte Igueldo, with fantastic views of the Bay of Biscay. Pedro Subijana has earned himself a little star, and we were all looking forward to this meal. Once again we are able to order everything in half portions, and I'm absolutely loving the practice here in Spain! Make your own dégustation menu! Manitas de cerdo con carrilleras (half portion) - yummy piggy goodness with trotters and cheeks. Foie a la sartén con sofa de nueces - all of us shared this. One of the others tried the Gin-Tonic en plato, which is a deconstructed gin and tonic as a dessert. Very cool. We had a bottle of 2002 Kastanienbusch Riesling, but can't remember the winery… I also had a glass of 1998 Disznóko Tokaji 5 Puttonyos. Nice lunch in a lovely restaurant on a beautiful day. What more can you ask for? After our nice lunch at Martín Berasategui today, we went back to San Sebastián for our second 3-star meal of the day - at Arzak with our traveling companions Mr. and Mrs. Locust. Plátano frito con mousse de "arraitxikis"
I can honestly tell you that I remember almost nothing from this meal… That's how underwhelming it was. We drank a bottle of 2000 Clos Erasmus with dinner. I love this wine. What was memorable was how we got dissed by Juan Mari Arzak. We saw him make his rounds to chat with the guests, and eventually made his way to our table. We told him we were from Asia and that the Locusts were from Singapore (at the time), and he started mumbling about having been to Singapore. He then made his not-so-graceful exit and escaped from our table, after about a minute or so… or maybe less? We were flabbergasted. He took time to speak with every other table - except ours. And I do believe he speaks good enough English… he just chose not to talk to us. As we left the restaurant and stood outside waiting for a taxi, Juan Mari came to say goodbye, but again made his escape after a couple of sentences. So I guess none of us will be going back to Arzak again. Took a taxi out to have lunch at Martín Berasategui, one of the 3-star restaurants I'm hitting on this trip. Upon arrival we were led through the lovely indoor dining room, and asked whether we would like to sit indoors or out on the patio. As it was such a nice day, we decided to park ourselves outside. No sooner had I sat down than when the scolding started… I decided that since we were dining at a 3-star restaurant - and similar establishments in France are all very formal - we should dress up for lunch. I wore a summer suit but left out the tie, while I forced asked G to wear a little cocktail dress. She hated the idea but I insisted. Lunch today was at Cachetero Comidas in Logroño - a recommendation from Quintessentially for a place in town. Four of us shared all the dishes. Jamón o lomo ibérico "Joselito"
Rostrizo asado - a very nice roast suckling pig.